Mired by politics, fraught with undercurrents of unrest, the city of lights holds hostage a generation, that is the otocinclus, in the aquarium. This picture with a thousand ironies, sadly, has become the face of Pakistan to the outer world and within. The young man with a slightly confused and weary look, is scrimmaging through garbage for his livelihood, at a time, when children are getting up from warm beds, to get ready to go to school. What breaks your heart, is the shirt he dons on top of his shalwar. It’s a crescent and a star, the flag of our beautiful country. But little does he know how much this country owes him, what his rights are. To protect him, nurture him and give him a much needed future, rather than being a garbage scavenger. 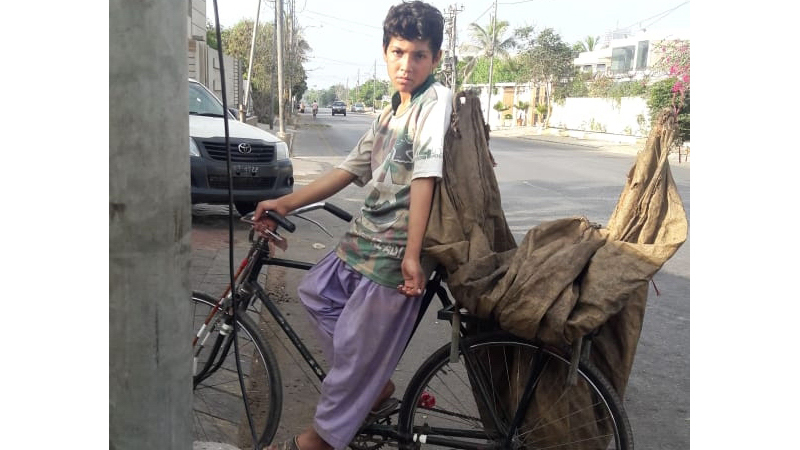 He may have left his home at the break of dawn on his bicycle, to reach DHA. I wonder, would we have the heart to send our children, at that time of the day, to scavenge through garbage, to earn a living. It’s a picture unimaginable, because even imagining it is far from possible. Some may debate he’s not our responsibility, even the worst thought that some have no qualms in saying out loud, that he was born to this life, or he is the duty of the state. But, on a basic humane level, we are all responsible, he is our child. Not very different, made from flesh and bone, he is very much like our own, especially at that age when their likes, dislikes and dreams are very similar. But the deciding factor, the guillotine, the axe that befalls all his future dreams, is his economic status, which brands him with a cell number, to which he will always be a prisoner. In this affluent city, where patrol cars guard the the houses, and sirens wail giving protection to official cars, or the endangered species of this country. Lives a race, unrecognised, undistinguished, underprivileged, the otocinclus of the human fish tank. But who cares, how they survive. This little boy may have dreams also, that somehow, someday, by some miracle his life may change. Maybe that day when i stopped the car and asked him, is this what he does for a living, and why isn’t he at school, may have sparked a hope in his heart. The hope that maybe my fortune is changing, that maybe this dream that i have been dreaming, is about to come true. One of a million and more, of these faces, each one with a dream, each one with the hope, each one with the wish for a better future, sadly live somewhere scavenging through our garbage. His dream of a better life buried deep in his heart, and his future buried even deeper, in the heap in front of him. Published in Daily Times, November 11th 2018.